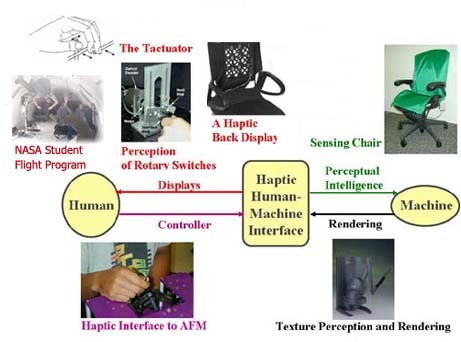 The Haptic Interface Research Laboratory at Purdue University is dedicated to research on the underlying principles for the design, development and evaluation of human-computer interfaces, with an emphasis on haptic interfaces (view video presentation, real player format). Our multidisciplinary research program combines approaches in Electrical Engineering and Computer Science, Mechanical Engineering, Psychophysics and Biomedical Engineering. Efforts range from hardware development to algorithm design and human performance measurement. Our research projects have a common theme – they all have something to do with a better understanding of how to transmit information through the sense of touch in a more intuitive and effective manner. The following are a few highlighted projects.